There’s nothing much to talk about Walton’s popularity in Bangladesh’s smartphone market. Till now, they have released a number of smartphones and have managed to attract a large base of customers in the country. If you manage to visit any Walton outlet, especially the one in Bashundhara City, you’ll see the proof. From last year, Walton has been releasing high end smartphones such as the Walton Primo N1, Walton Primo X2, Walton Primo X1, Walton Primo RX at an affordable price tag. As there’s no stopping them to increase their product lineup, they have started the year 2014 with a bang by adding a new device to their arsenal, Walton Primo ZX. When I reviewed the Walton Primo N1 last year, I was mesmerized by the size of the device. It simply wasn’t normal to have such huge devices as a phone. Now, as having large displays is becoming a norm, it didn’t feel weird to hold the Primo ZX which boasts a 5.5-inch TFT LCD display compared to the 5.3-inch Walton Primo N1. With a 1920 x 1080 resolution and a pixel density of 400 ppi, the screen is quite sharp and looks impressive with very thin bezel at 2.3mm. One might picture the phone as a clone of Nokia Lumia device but once you hold it, you might change your mind. The display is protected with a Gorilla Glass 3 sheet to act as a line of defence from the scratches that the phone might face. At first sight, there’s nothing much to complain about the display as the colors look quite good. With brightness set at full, it was possible to view the display from any angle. For button placements, the power button is placed on the top with the volume control ones at the side. The mirco USB port is situated at the bottom as you can see from the picture below with the speaker surrounding it. Below the display, there are three Android capacitive buttons which could have been better lit up. The build quality of Walton Primo ZX is average but it would have been better if the rear didn’t have a glossy finish as it would eventually become a magnet for fingerprints. Users wouldn’t really want to have the cheap look once the rear gets filled up with smudges. However, if this factor is ignored, the device felt quite good to hold, thanks to the slightly curved back. Looks can be deceiving as what matter the most is what’s inside the box. Walton Primo ZX is armed with the latest Snapdragon 800 chipset which gives it a boost when compared to other smartphones and this is one of the main reasons why this particular smartphone is getting such hype. The chipset has a quad-core Krait CPU which runs on 2.2GHz and for the graphics, it packs an Andreno 330 GPU and is powered by a 3GB RAM. After doing a benchmark test in Antutu, Walton Primo ZX scored 34101 which thrashes the score of Sony Xperia Z Ultra. and is seen to have a performance similar to that of the latest Samsung Galaxy Note 3. Impressive, indeed! After constant swiping and opening up new applications, the device didn’t sweat much and managed to work quite well. Played the existing games at ease, though it wasn’t possible to try out the high-end ones. The probability of those working well is high due to the existence of the Snapdragon chipset and the latest Andreno 330 GPU. 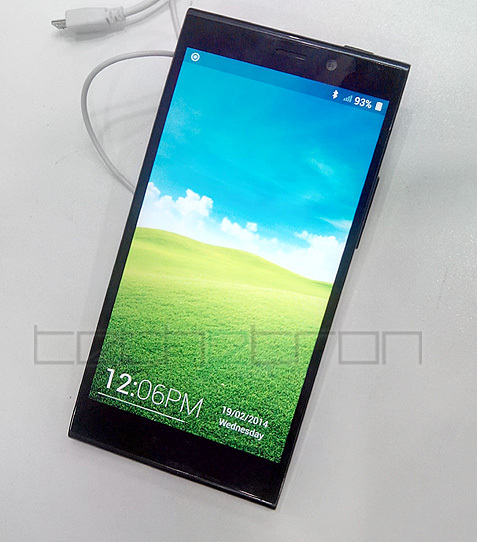 Walton Primo ZX runs on the late Android 4.2.2 but unfortunately, it doesn’t pack a stock Android. As soon as you go to the menu section, you might be confused with the UI. This ‘special’ UI is called Amigo 2.0, which I personally loathed. 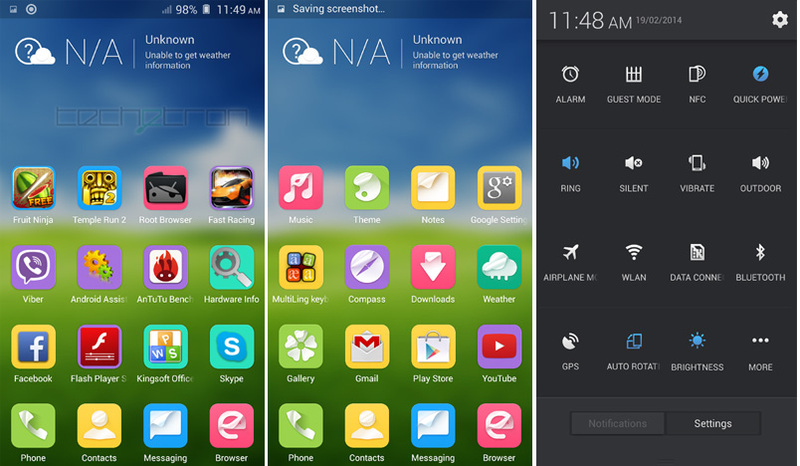 Take it as an example of Samsung’s TouchWiz. As I was browsing through, I was looking for the right button to press which would take me to the applications panel, but little did I know there’s nothing of that sort here. All the apps are stored right on the homescreen. The huge buttons, in one way, destroys the elegant feel that you would experience while holding the device. This is my personal experience and views might be different for all. For those who do not like it, there’s always the option of downloading a launcher for your phone. Why not download the Android 4.4 KitKat launcher instead and change the look? Apart from the appearance, it does come with some interesting features such as classifying messages automatically, live task cards between apps, camera features, touching the screen to wake up from sleep and many more. 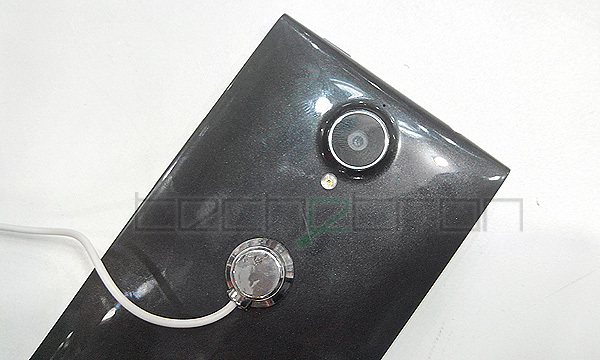 Walton Primo ZX’s camera is another reason why users might be interested on it. On the rear, there’s a 16-megapixel camera with LED Flash and has a 1/2.3-inch sensor with large 1.34 micro meter pixels which is way higher than the normal existing smartphones. The lens is said to be custom made by Largen. According to the camera specs, the camera sensor is apparently better than Xperia Z1 and iPhone 5. Turn the phone, you don’t have a VGA or a 2-megapixel front facing camera but a 8-megapixel one which would have almost the same features of the rear camera. Another interesting feature of the Walton Primo ZX is that it will be able to play 4K video content! Haven’t heard such feature in smartphones as there isn’t much 4K video content available around. Here’s a video showing the 4K video playback. Sound quality is impressive too. While recording this video, there was a huge crowd but it was still possible to hear the music of the video sharp and clear. Dual Band Wi-fi b/g/n (2.4 and 5 GHz), NFC, Bluetooth V4, Micro USB V2, OTG, and Accelerometer (3D). To keep Walton Primo ZX running, its powered by a 2750mAH battery and would have a 32GB storage space for your needs. Sadly, the battery is non-removable and there is no provision of a microSD slot. With a very powerful processor and an impressive camera both at the rear and front, Walton Primo ZX can surely be a good buy for a customer who’s looking for a device which is speedy and has an awesome camera. The smartphone would have been a steal if it would have stock Android installed instead of the Amigo 2.0 UI. However, to some, they might appreciate the change. The low powered non-removable battery gives the device a blow and absence of a microSD slot extends it further. If you’re a person who doesn’t download much apps, the micro SD issue can be ignored. If you love taking photos, there’s no need to worry about storing your shots. Just sync your profile with a cloud service and you have an additional storage space! 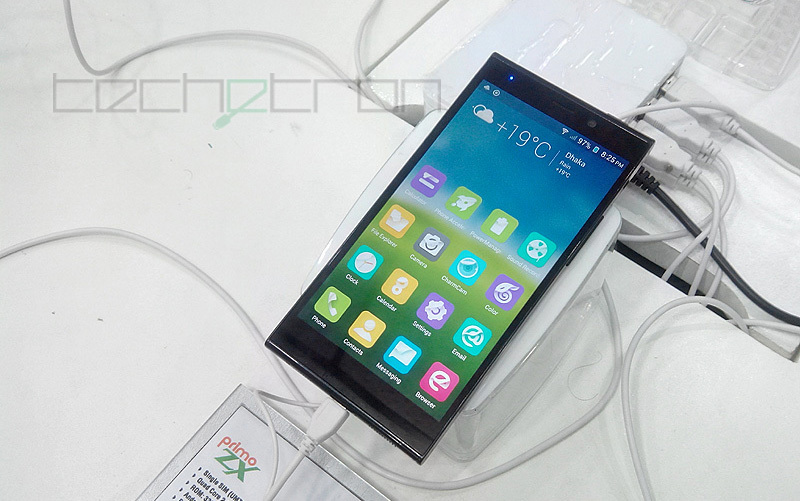 Walton Primo ZX will be launched a the end of March and will probably carry a price tag ranging from Tk. 30,000 to Tk 35,000. For now it will be available in only Black and White. Is is possible to upgrade from jellybean to kitkat? accha ami ai phone ta kinte icchuk…asole kena ta ki valo hobe? I use a primo x1 which they declared is fitted with gorilla glass. Rubbish! It simply broke falling from my hand on the ground the other day. I want to make this broken rubbish a public. Good phone, but for the price there are better options… such as older models of Smasung! Is it possible to root Walton phones? Since they run on Snapdragon chipsets, I’m guessing some of the drivers that run the phone are open source based. If so, then running stock AOSP shouldn’t be that much of a hassle (given there are developers working on the phone). Root the phone, flash a custom ROM and you’re good to go. Does Primo ZX have the option to receive OTA Firmware Updates? That was a great hands-on review. The phone looks decent enough. Hey! Thanks for pointing it out! We have made a typo mistake there. It does pack a 2.2GHZ processor, not 2.5.